Matchboxes and matchbooks issued by car manufacturers & suppliers. To start with, two old matchbooks, both issued by car manufacturers but separated by thirty years. The older example was given away by Kennings Ltd, whereas the newer item came from a Saab dealer, at the launch of a new 900. 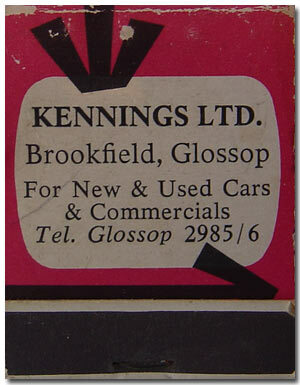 The first small matchbook contained Bryant and May's safety matches, and was given away by Kennings Limited, of Brookfield in Glossop. They dealt in new and used cars and commercials, all from the BMC motor group. On one side is the company's address, as shown in the picture alongside, and on the other side, a list of the marques they dealt in - namely Morris, MG, Wolseley, Riley, Morris Commercial Vehicles, and Nuffield Tractors. Flick the matchbook open, and your pipe chewing Wolseley buyer would be delighted to see a set of individual safety matches, each printed with one of the vehicle makes that Kennings dealt in - nice touch. Fast forward thirty years from the days of BMC, and we have a freebie from Saab, by this time another brand within the GM empire. The box of matches was a giveaway in the mid 1990s when they launched the GM-powered 900, replacing the proper Saab-designed 900 (itself based on the 60s 99 model). The new 900 looked vaguely like the old model, and incorporated the side sweep alluded to on the cover of this matchbox. However its underpinnings, rather than being hewn from Swedish stone as on the old model, were re-worked Vauxhall Vectra. Saab enthusiasts shook their collective heads in dismay. Not that they were bad cars, but some of the trademark Saab quirkyness was gone forever. The following three matchbooks were all produced by Bryant & Mays Matches, and each feature advertisements for companies involved in the motor trade. The first, slightly tatty, example promotes Newton Motor Oils, a range of lubricants produced by Ernest Newton & Co. Ltd of Birmingham. Previously the firm had been known as Notwen - a promotional vehicle, based on a vintage Rolls-Royce and used to promote Notwen oils, can be seen here. The illustration on this 1950s' notebook shows a modern car streaking along, with a tiny veteran car also included at the top right. Mobil & Snail Brand tools. The next two examples are identical in size to the Newton Oils matchbook shown above (4 x 1.5ins approx). One promotes Mobil products - namely Mobilgas Special ("For Flying Horsepower") and Mobiloil Special ("For all seasons, all weathers"), and the other Snail Brand hand tools. The latter will be familiar to anyone who had tinkered with an old car, so commonplace were their spanners in the toolkits of British cars and motorcycles. The rear of the matchbook lists some of their products: hammers, hatchets, garden tools, spanners (chrome, vanadium & carbon steel), plus their adjustable & pipe wrenches. Snail Brand tools were produced by Thomas Smith & Sons of Saltley Ltd, Saltley Mill, Birmingham. 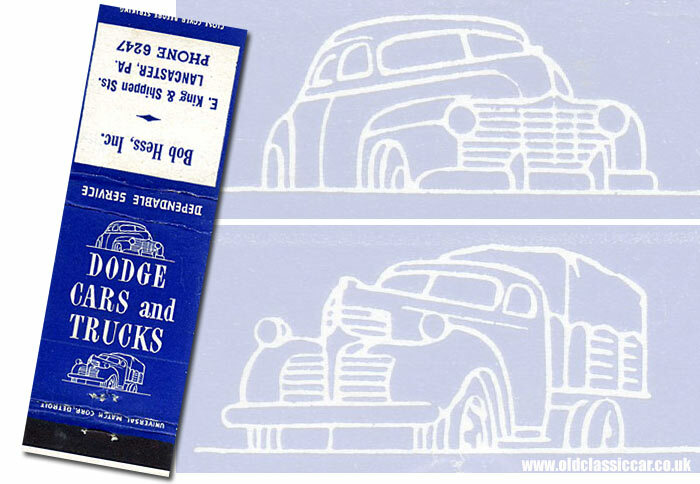 The following matchbook was produced by the Universal Match Corp. of Detroit, Michigan, on behalf of Dodge car and truck dealer Bob Hess Inc., of Lancaster, PA, USA. The cover features an illustration of both a Dodge car and a truck of the 1940s era, along with the "Dependable Service" slogan.